Access to water is a problem and water quality is a problem in many countries. Since 2011 Helvetas Swiss Intercooperation and the ETH-Water Research Institute Eawag have disseminated their methods for water treatment at the household level. The key method is SODIS. Their partnership brings together the strengths of the two institutions. From Eawag, this is its wide recognition as a Research Institute for Water and Sanitation and Helvetas brings its long experience working in the area of water development. Helvetas Swiss Intercooperation has assumed the management of the SODIS/HWTS Project 2014 from Eawag and is the main spokesperson for the SODIS projects. SODIS at a glance: The first part presents the basic facts about solar disinfection and the SODIS method, gives information about the history of the SODIS method and highlights its benefits. It also discusses the niche of SODIS in the context of HWTS and WASH and the potential impact and role of SODIS in relation to programs aiming at reducing the prevalence of diarrheal disease. Technical aspects of the SODIS method: The second part addresses the technical aspects that influence the efficacy of the SODIS method in removing pathogens from water. This information aims at providing a solid understanding of the correct application of SODIS in the field, and of the expected outcomes under various conditions. Promotion of the SODIS method: The third part reviews specific approaches and tools used to promote the SODIS method to target populations. It aims at supporting experts with the integration of the SODIS method into HWTS, WASH and health projects. The publication is available >> here. Sandec, in partnership with the EPF Lausanne, is launching its second Massive Open Online Course (MOOC). The course is entitled “Planning & Design of Sanitation Systems and Technologies”, and is for free, in English and has French subtitles. Join the course and learn how to plan affordable and context-specific sanitation solutions. We will present examples of successful and failed urban sanitation systems in low- and middle-income countries. For further information and to sign up for the course, please go to: www.coursera.org/course/sanitation. On 7 April 2014, the Department of Water and Sanitation in Developing Countries (Sandec/Eawag), in partnership with the EPF Lausanne, is launching its first Massive Open Online Course (MOOC), entitled “Introduction to household water treatment and safe storage”. The course is free, in English and has French subtitles. For further information and to sign up for the course, please go to: www.coursera.org/course/hwts. In addition to effective behavior change campaigns, the long term application of household water treatment methods depends on the availability and affordability of HWTS products (SODIS bottles, chlorine tablets of solution, filters). 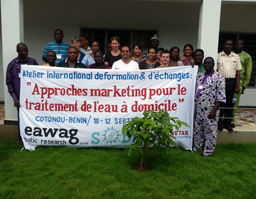 The international SODIS partner workshop in Benin, September 10-12, focused on market-based approaches for the dissemination of such products. Participants from Asia, Africa, and Latin America shared experiences from their own projects, and jointly developed detailed business-models for selected case studies.